We have already had an opportunity to discuss planting dates in corn for North Dakota in an earlier blog post. However, now that the planting window is wide open for our state, I wanted to revisit this topic. The NDSU Extension Cereals Agronomist, Dr. Joel Ransom, wrote a nice article for the first issue of the Crop & Pest Report, and it was on corn. 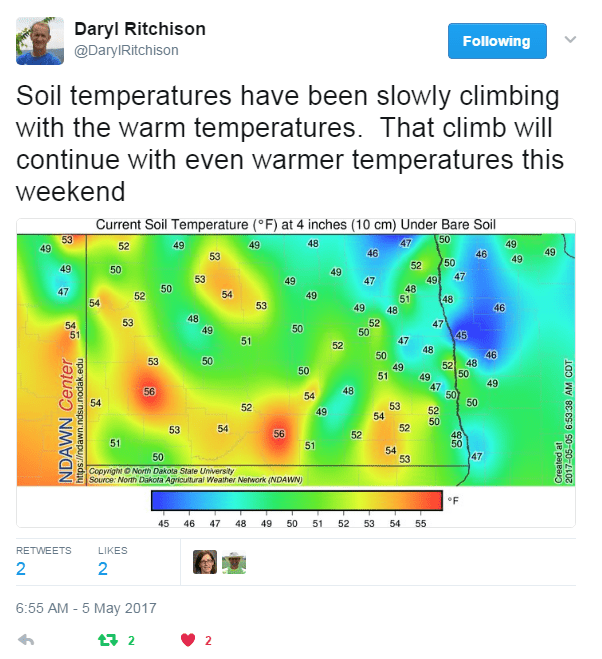 He discussed the same topic I did on cold soil and planting dates, so I will provide a link to it here to see this topic from his perspective: https://www.ag.ndsu.edu/cpr/plant-science/planting-corn-into-cold-soils-05-04-17 . I encourage you to read his article, and to always give the Crop & Pest report a scan through or read, great content. Overall, we seem to be safe for corn planting in ND, however there may be some micro-climates where this topic is still pertinent for a few more days. To conclude this article, I hope that you all are finding very little time to read blog posts like this one, due to a successful planting season being underway.